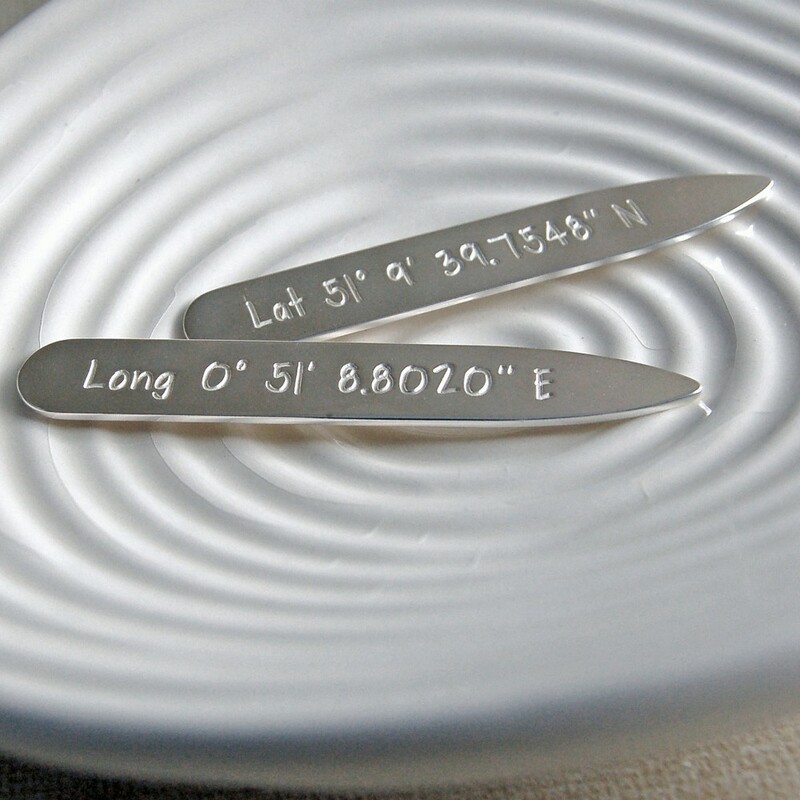 Keep your shirt collars looking sharp with our handmade personalised sterling silver latitude and longitude coordinates shirt collar stiffeners. 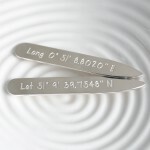 These silver shirt collar stiffeners (also known as collar stays) slip into the underside of a shirt collar to keep it sharp and crisp and make a practical yet very personal gift for the man who has everything. 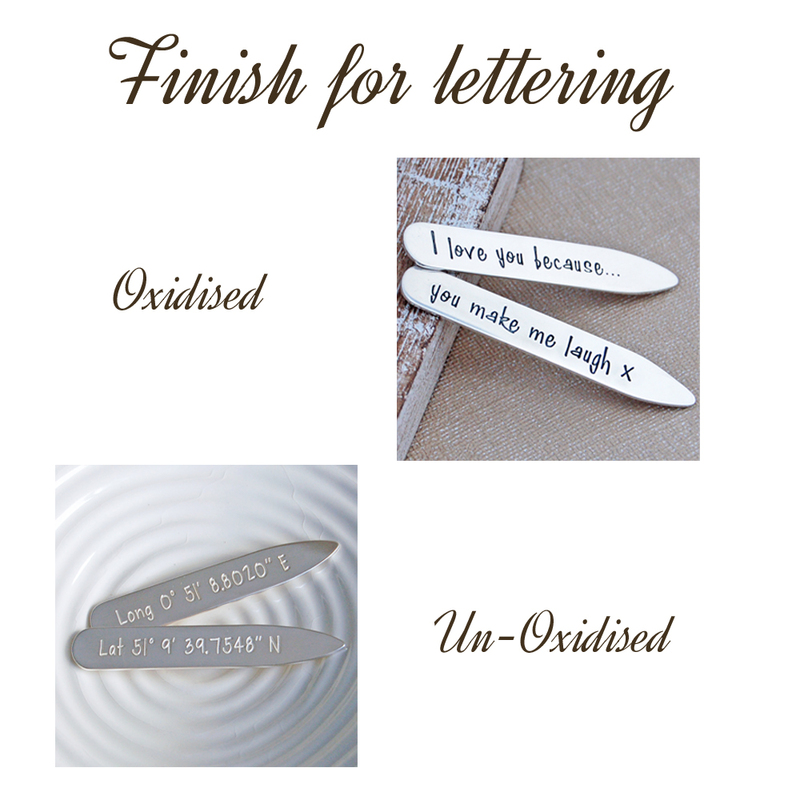 A perfect present for husbands, fathers, sons, grandfathers, Grooms or the Best Man as they can be personalised especially for each individual. 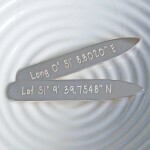 A unique gift to celebrate special occasions such as the birth of a new baby, Christening, Wedding, Anniversary, Father’s Day, Birthday or Valentine’s Day that will be treasured for ever. 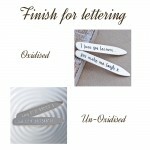 IndiviJewels designs and handmakes all its own work so if you would like something a little different then please just contact us and we will see what we can do for you. 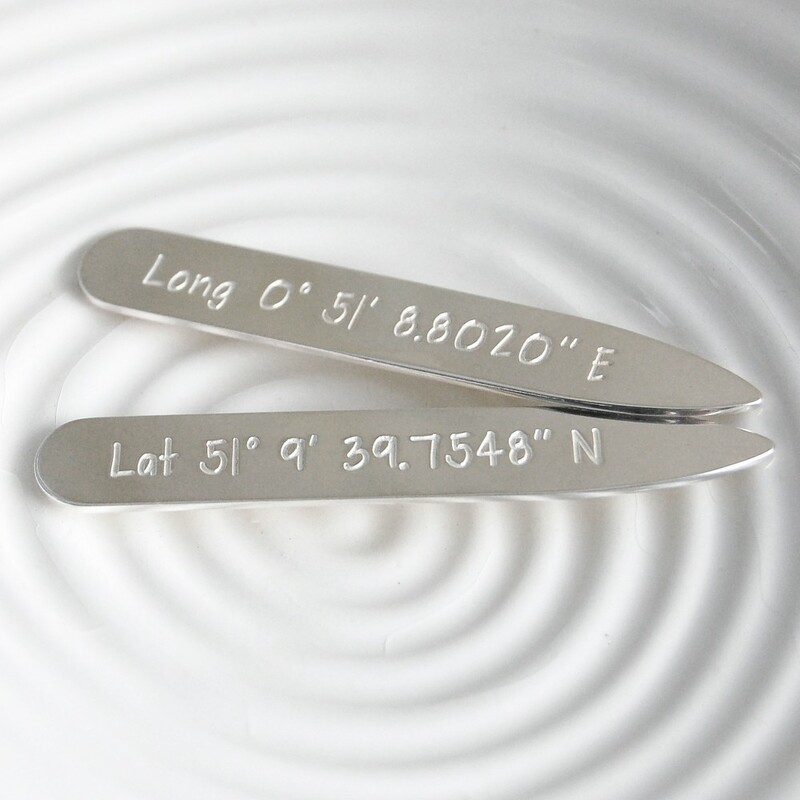 Our shirt collar stiffeners are hand cut from 1mm thick sterling silver sheet and then beautifully etched with the Latitude and Longitude coordinates of your choice. 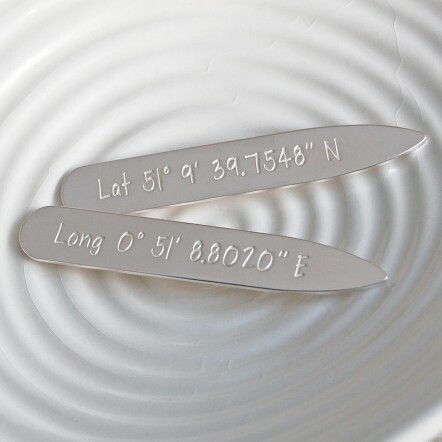 This could be the place you first met, your wedding location, your baby’s birth place, or even the location of a memorable holiday – anything meaningful to your special man. 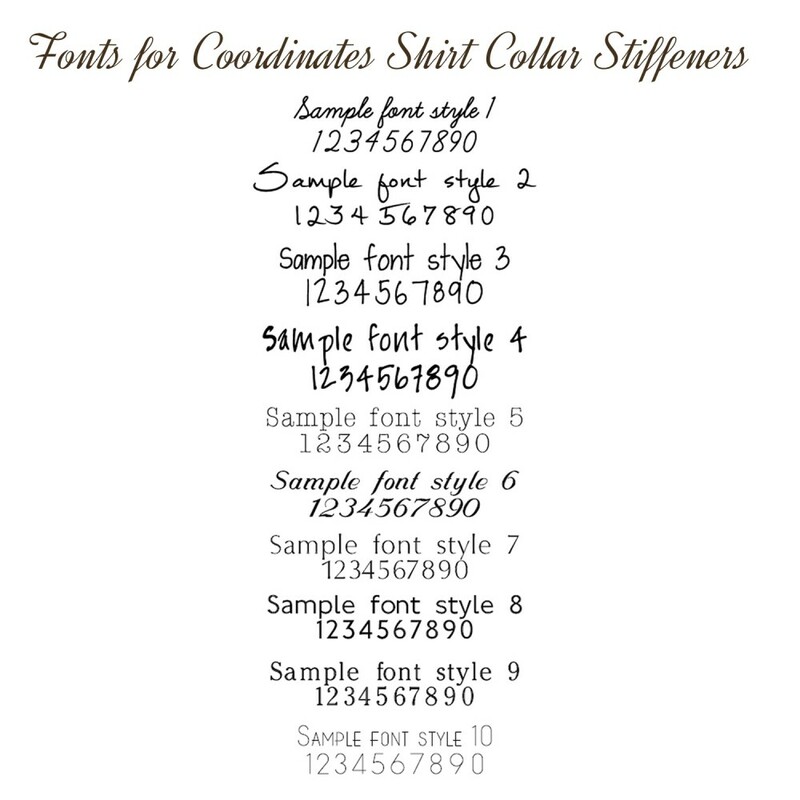 Coordinates can evoke special memories in a very private and subtle way as only you know their locations and meanings. We can etch up to 30 characters on each collar stiffener so there is plenty of room to also include Lat and Long preceding the actual coordinates if required. 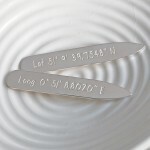 Our sterling silver personalised coordinates shirt collar stiffeners will be handmade in the UK especially for you and will be beautifully wrapped in tissue paper and packaged in an IndiviJewels gift bag. Our silver shirt collar stiffeners measure 6cm in length and 1cm wide and are 1mm thick.